Perhaps the biggest reason why most streamers choose to focus on PC gaming is the difficulty of streaming from a console. Many consoles make it difficult to capture gameplay, so streaming from a console is confusing and sometimes complicated. The same is true of mobile games, though the solution to the two is much different. In contrast, you are often streaming from the PC that you are playing games on, which cuts a lot of time and possible technical issues. Capture cards are quickly helping to solve this problem, and close this gap. Put very simply, a capture card can take audio and visual information from a gaming console and store it on an SD card or feed it to a computer. Scroll down to read our in-depth review of each product. do I need a capture card to stream? Unsurprisingly, the streamers who will need a capture card are streamers who want to play console games. There are three main reasons for using a console on stream: budget, preference, and exclusivity. Streamers on a budget, especially streamers of college age and younger, often own a gaming console already. Because of this, it can be much easier for them to find solutions that fit with what they already own than to buy a new gaming computer. If you are one of these people, you may be disheartened by the price of most capture cards, but we will provide options for all price ranges below. Some streamers simply prefer to game on a console. This is an uncommon opinion, but a valid one nonetheless. Rapper Danny Brown recently began streaming, and you will often see him on his PlayStation 4. Exclusivity is an issue that many streamers have to work around. As I’m writing this, there are hundreds of people watching Halo 5. Of course, Halo 5 is only available on the Xbox, as the franchise has been since its beginning. Most Nintendo games suffer from this same issue, as Nintendo prefers to keep its many franchises on only their consoles. Of course, any “party streamers” will likely want to look into a capture card, as well. While PC games do sometimes support multiplayer, mostly in online form, there are a breadth of console games that are designed with multiplayer and co-op play in mind. From Mario Party and Mario Kart to Rockband and Guitar Hero, some games are just more fun with other people around. For people who aren’t just a person, capture cards aren’t a necessity, but they can certainly help. Finally, some streamers use a capture card even when PC gaming. While the benefits of this are unclear, they are important to understand. If you are using an older computer or playing very intensive games, a capture card can help you to clear up CPU resources while gaming. Elgato has a very strong grasp on the capture card market, and have consistently produced the highest quality products for a long time now. Their newest addition, the HD60, allows you to capture 1080p video at 60fps from any major gaming console, and feed it to your PC. Elgato boasts that they have increased the performance of the capture card by using a cutting-edge encoder, while still using the “tried and true” USB 2.0. The Game Capture HD60 can record video and audio, including game chat, and has a sleek, matte black shell that makes it look great when in frame. While 62% of Amazon users gave this capture card a full five stars, a few had issues with it. The most common of these is with the ability to capture game chat, which they said often got erased. 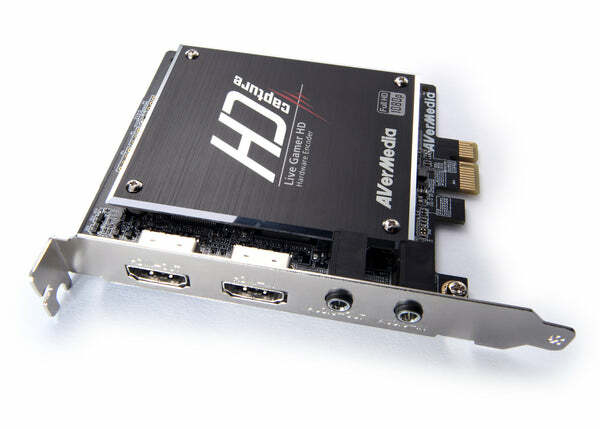 If Elgato is the frontrunner in the capture card world, AVerMedia is running a close second. Offering a full package of equipment for streamers, AVerMedia now provides a very strong capture card. Some have noted that it’s encoding sometimes leaves behind empty files, but this is a small problem for this much power. Able to be used with a PC, the Live Gamer HD can free up a significant chunk of CPU. For those on console, this may still be behind the HD60, however, as it doesn’t offer 60fps video. While it’s not quite as pretty as the Elgato HD60 or AVerMedia Live Gamer HD, the Diamond GC1500 has one big thing going for it: it’s easily compatible with Open Broadcast Software, which almost all Twitch streamers use. The quality may not be 1080p, but if you want to stream that midnight release by 12:01, you cannot go wrong with the Diamond GC1500. Consoles comes with numbers, and we don’t all move between them easily. Hauppauge is aware of that, and designed their capture card with that in mind. Whether the PS1 or N64 strikes your fancy, the HD PVR 2 can handle it. While it isn’t as good as other options for PCs and newer consoles, it still provides fast and efficient video capturing for older consoles. Those using the AGPtEK HD Game Capture might have to put some work into getting it to work, but it’s a perfectly fine budget option. Still providing 1080p video, the HD Game Capture costs less than half of its companions. While you should only buy cheap gear if you absolutely have to, those who have to will be happy with this capture card.